Best Socket Sets Reviews 2019 - Our Top Picks! ​Unlike toolkits, most people pick up high-end sockets sets with more specific jobs in mind. Which more often than not revolve around mechanical maintenance and repairs. When looking to tackle these kinds of jobs, flawless quality and performance are of the highest importance. After all, these are the kinds of tools that tend to be subject to the heaviest punishment of all! While appearances may give the impression that most socket sets are similar, looks can be deceiving. In fact, differences are far as quality and performance go are often night and day. If looking for total value for money, it’s about more than simply buying the cheapest kit you can find. It might look the part and seem like a bargain, but chances are you’ll be disappointed with the quality. By contrast, pick up a superior kit the first time, and it could prove to be the only kit you need for the foreseeable future. In the following listings, you’ll find an overview of six of the best socket sets we’ve come across so far. Tried and tested by experts and everyday buyers alike, they’ve ticked all the right boxes in terms of quality and value for money. Unlike toolkits, most people pick up high-end sockets sets with more specific jobs in mind. Which more often than not revolve around mechanical maintenance and repairs. First up, there are certain tools, and toolkits you just know are a big deal when you first see them. In the case of the Stanley 92-839 Black Chrome and Laser Etched Socket Set, you’re looking at no less than one of the best-selling and highest-rating kits of its kind on the market right now. Great to look at, even better to get busy with! No expense has been spared in the production of the Stanley 92-839 Socket Set. Bodies are forged from chrome vanadium. Six-point and eight-point sockets reduce fastener rounding and slippage. Each chrome vanadium socket wrench features a quick-release & reversible mechanism for easy operation, with every component having been extensively tested and verified for unbeatable quality and safety. 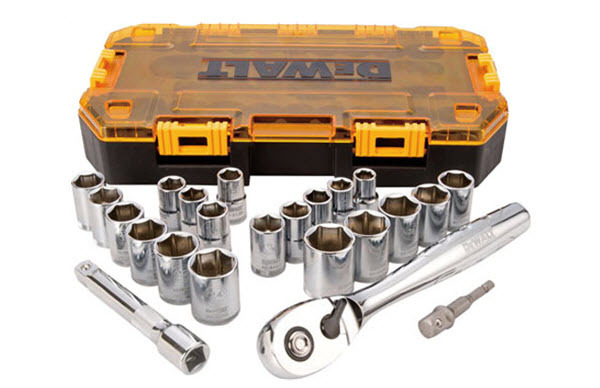 Designed to suit the needs of professional and domestic users alike, this ultra-premium kit comes complete with pear-head ratchets, deep well sockets, standard sockets, a spinner handle, extension bars, spark plug sockets, a set of bits, and a durable plastic carry case. Beautifully presented and etched with high-visibility markings, both the appearance and the corrosion-resistance of the extraordinary kit are on another level. The combination of looks to die for and performance to kill for add up to an unbeatable prospect from the folks at Stanley. Particularly when it comes to value for money, we cannot recommend anything more highly in this price range. Serious – experts and everyday users alike just can’t get enough of the Stanley 92-839 Socket Set! 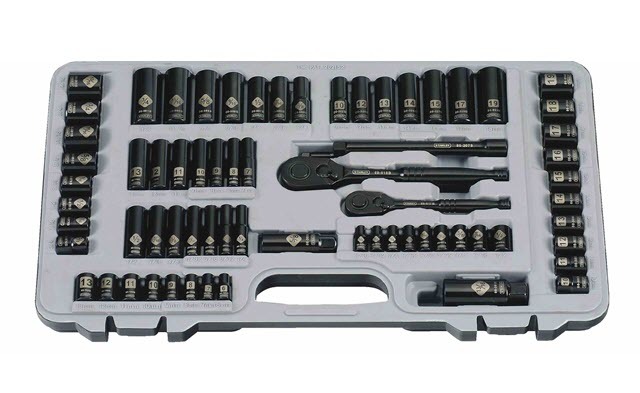 ​Boasting an extensive range of high-end tools and accessories for the most demanding users, the Stanley STMT71652 123-Piece Socket Set caters to the needs of even the most demanding professionals. Particularly outstanding if looking to take your mechanics’ tools arsenal to the next level. The Stanley STMT71652 boasts all the SAE and metric-sized sockets and drive tools you’ll need to cope with just about anything. Whether tackling DIY projects around the home or working in a professional garage, this Stanley Socket Set is just about as comprehensive as it gets. Every ratchet in the kit has been designed with 100% user-friendliness in mind and features an easy-to-use, thumb-operated reverse-switch mechanism. The case itself has been designed less for looks and more for practicality, which it nails pretty convincingly. The quick-release mechanism is perfect for one-handed use, while the attractive polished chrome finish provides outstanding anti-corrosion protection. Each chrome vanadium forged body ensures the highest possible torque, strength, and durability for even the most demanding applications. And as would be expected from a brand like Stanley, every tool has been tested in excess of ANSI specifications and comes with a limited lifetime warranty for total peace of mind. All in all, this Socket Set is all-business, no-fuss. 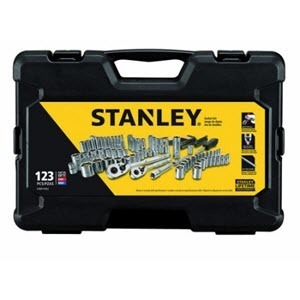 If you’re looking for an affordable kit that cannot and will not let you down, you could do far worse than checking out the Stanley STMT71652 123-Piece Socket Set for yourself! ​Third on the list, you only need to take a look at the Stanley 92-824 Black Chrome and Laser Etched 69-Piece Socket Set to know the kind of beast you’re dealing with. But then again, the very mention of the Stanley tool brand is enough to know you’re talking pure quality and performance. The Stanley 92-824 Black Chrome and Laser Etched 69-Piece Socket Set don't just look the part; it performs like a dream too. 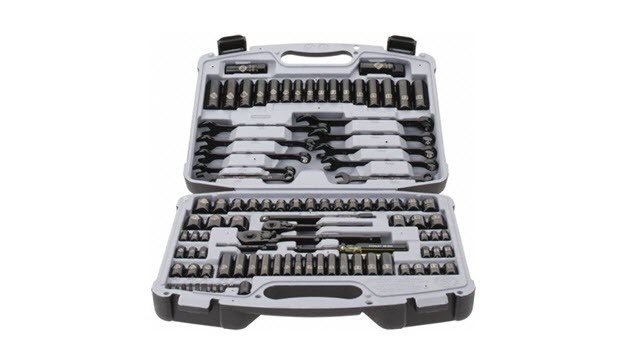 Everything about the Stanley 92-824 Black Chrome and Laser Etched 69-Piece Socket Set just scream quality and good taste. The black chrome effect is no less than gorgeous, while the laser-etched details on each piece make it super-easy to negotiate. As usual, the company’s famed Max-Drive design means up to 15% more torque than standard socket sets. The black chrome finish isn’t all about looks, as it also makes a big deal to corrosion-resistance and general durability. The two-piece case can be used to store and transport the kit or can be placed into a drawer to keep the set organized while not in use. Like the kit, the quality of the case is solid and reliable. All tools manufactured by Stanley meet or exceed ANSI specifications and carry the pedigree of decades of industry experience. Each ratchet features a quick-release mechanism for one-handed use, making it easy to secure and release every socket and extension at the touch of a button. 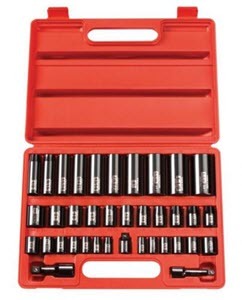 So once again, just about the only socket set, you’ll ever need for a price that’s hard to resist! 1, 3/8" Drive Spark Plug Socket – 5/8"
1, 1/4" Drive Extension Bar – 3"
1, 3/8" Drive Extension Bar – 6"
Next up, the SK Hand Tools 44-Piece 1/4-Inch Drive 6-Point Fractional/Metric Socket Set has been designed to offer no-frills, all-action performance for even the most challenges of workplaces. Extreme corrosion-resistance and unrivaled durability add up to a kit that doesn’t know how to let you down! 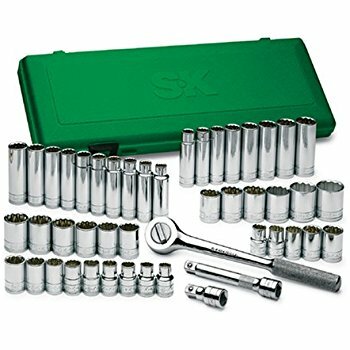 The SK Hand Tools 44-Piece 1/4-Inch Drive 6-Point Fractional/Metric Socket Set might not be as pretty as the Stanley kit above, but boy is it impressive! With its durable SuperKrome finish, it’s built to withstand the kind of punishment they average kit simply wouldn’t be able to deal with! Incredible corrosion resistance and the highest quality materials add up to the total package of quality and performance. Every socket has been designed with the brand’s famed SureGrip hex technology, meaning a super-secure grip, maximum torque, and minimal breakage. Along with a heavy-duty plastic case, the kit also comes complete with a reassuring limited lifetime warranty! 4-1/2-inch pro ratchet; 2- and 6-inch extensions; 3/16-, 7/32-, 1/4-, 9/32-, 5/16-, 11/32- 3/8-, 7/16-, 1/2-, and 9/16-inch standard sockets; 1/4-, 9/32-, 5/16-, 11/32-, 3/8-, 7/16-, 1/2-, and 9/16-inch deep sockets; 4-, 5-, 5.5-, 6-, 7-, 8-, 9-, 10-, 11-, 12-, 13-, 14-, and 15-millimeter standard sockets; 6-, 7-, 8-, 9-, 10-, 11-, 12-, 13-, 14-, and 15-millimeter deep sockets. 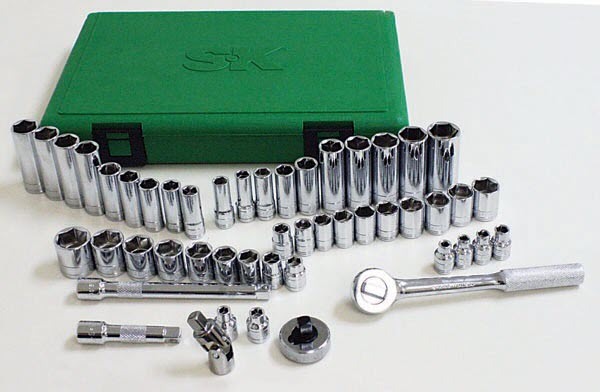 The SK 91844 Socket Set is a no-nonsense kit that focuses on performance above everything else – a brilliant addition to any home or professional garage! ​Next in line comes the seriously capable ​Bostitch BTMT72287​, which is well-deserving of a place on our list. This set has more in common with the SK kit above, in that it’s less about looks and more about performance. Not that it doesn’t look fantastic – it’s just that polished black chrome really is hard to resist! Like the rest of the kits in this list, the Bostitch BTMT72287 has been designed to cover every possible need from top to bottom. The chrome vanadium steel construction of each and every piece means performance you can rely on and quality that lasts. 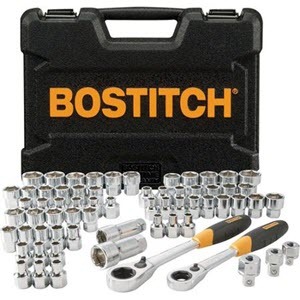 What’s more, tests have shown how the unique design of Bostitch sockets can produce up to 15% more torque than standard ratchets and sockets. Each piece is also stamped with its size marking in clear detail for added convenience. One thing that definitely stands out about the Bostitch BTMT72287 is the addition of a comfortable and secure grip to each of the ratchets. Which in turn makes for not only a more comfortable experience but better results in general. In addition, the whole kit has been designed to make one-handed use as easy and convenient as possible. 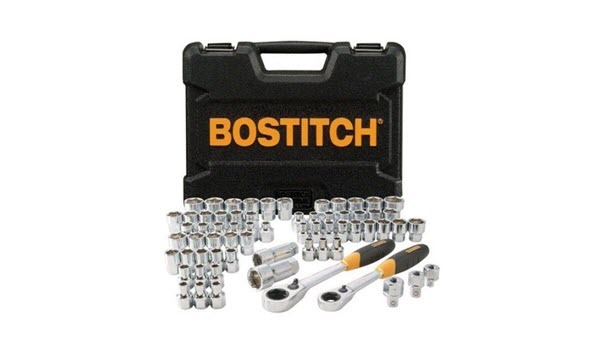 When it comes to longer and more intensive jobs, the Bostitch BTMT72287 stands out as a serious socket set of choice. ​So, what does the​ TEKTON 4888 socket set​ bring to the table that its rivals lack? The answer…that gorgeous black chrome finish you can’t help but be drawn to! Just like the Stanley set at the beginning of the list, this is one kit that does a great job combining outstanding looks with the quality you can count on. You’d be hard-pressed to find a fastener of any shape or size that the TEKTON 4888 can’t deal with. That said, it’s worth pointing out that the kit doesn’t come with any impact wrenches of its own. Which means you’ll need to find these elsewhere, but if looking to tool-up with the most outstanding set of sockets out there, you won’t go far wrong with this kit. The TEKTON 4888 kit has been designed to deal with the toughest and most demanding jobs out there. Rusted nuts, seized bolts and pretty much anything that wouldn’t otherwise refuse to move. The sockets included cover just about every shape and size you’ll ever need, while the high-strength chrome vanadium steel easily withstands anything can throw at it. Precision-crafting ensures the most secure fit, minimising the likelihood of stripping fasteners or damaging sockets. The finish is gorgeous, and the laser-etched size markings are easy to read, even in poor lighting conditions. (6) 3/8 in. drive shallow 6-point sockets (inch): 3/8, 7/16 (11 mm), 1/2, 9/16, 11/16, 3/4 inch (19 mm); (7) 3/8 in. drive shallow 6-point sockets (metric): 8 (5/16), 9, 12, 13, 14, 16 (5/8), 17 mm; (11) 1/2 in. drive shallow 6-point sockets (metric): 10, 11 (7/16), 12, 13, 14, 15, 16 (5/8), 17, 18, 21, 24 mm (15/16); (10) 1/2 in. drive deepwell 6-point sockets (inch): 1/2, 9/16, 11/16, 3/4 (19 mm), 13/16, 7/8 (22 mm), 1, 1-1/16 (27 mm), 1-1/8, 1-1/4 inch (32 mm); (1) 1/2 inch (F) x 3/8 inch (M) reducer; (1) 3/8 in. drive x 3 inch extension bar; (1) 1/2 in. drive x 3 inch extension bar; (1) carrying case. ​Once again, hard to beat if you’re looking for high-end sockets to use with your existing impact wrenches. Once again, hard to beat if you’re looking for high-end sockets to use with your existing impact wrenches. Part of the brand’s superb stackable collection of toolkits, the DEWALT DWMT73804 Tough Box Drive Socket Set delivers 34 pieces of pure engineering quality. Perfect for professional use and DIY mechanical projects across the board, it’s another winner from DEWALT that’s an absolute bargain for the price! ​With the DEWALT DWMT73804 Tough Box Drive Socket Set, it’s all about convenience. Along with every socket size, you’ll ever need, the tray has been designed to fit most tool chests like a glove. With the top of the case attached, it can be transported anywhere with ease. 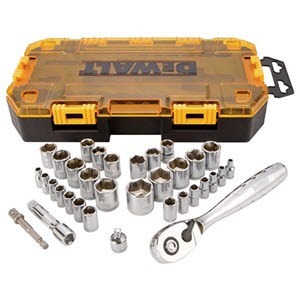 And as mentioned, the DEWALT DWMT73804 Tough Box Drive Socket Set forms part of the brand’s full collection of stackable kits for unrivaled convenience. Each premium-quality chrome piece is laser-etched with size information for total convenience. The chunky ergonomic wrench handle makes for easy and comfortable use, even when tackling more difficult and prolonged jobs. Plus the secure snap lever makes for the most convenient one-handed operation, delivering a secure hold and instant-release at the flick of a switch. ​Truly outstanding quality from a brand with a reputation for delivering nothing less! With the DEWALT DWMT73804 Tough Box Drive Socket Set, it’s all about convenience. Along with every socket size, you’ll ever need, the tray has been designed to fit most tool chests like a glove. With the top of the case attached, it can be transported anywhere with ease. And as mentioned, the DEWALT DWMT73804 Tough Box Drive Socket Set forms part of the brand’s full collection of stackable kits for unrivaled convenience. Each premium-quality chrome piece is laser-etched with size information for total convenience. The chunky ergonomic wrench handle makes for easy and comfortable use, even when tackling more difficult and prolonged jobs. Plus the secure snap lever makes for the most convenient one-handed operation, delivering a secure hold and instant-release at the flick of a switch. Truly outstanding quality from a brand with a reputation for delivering nothing less! Last but not least, the Craftsman 220 pc. Mechanics Tool Set delivers exactly what it promises. That being, 220 pieces of the most outstanding hardware you’ll ever add to your tool collection. Not to mention, just about everything the professional (or home ) mechanic is ever likely to need. Whether tackling a few maintenance issues at home or running a professional garage, the Craftsman 220 pc. Mechanics Tool Set is the total package. There’s not a great deal that needs to be said about the quality of the brand – a household name on a global basis for good reason. Every piece the kit contains is manufactured from the strongest alloy steel on the market, with the addition of a chrome-plated finish for total corrosion resistance. 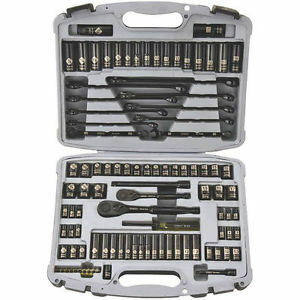 Along with a whole catalog of sockets and accessories, the Craftsman 220 pc. 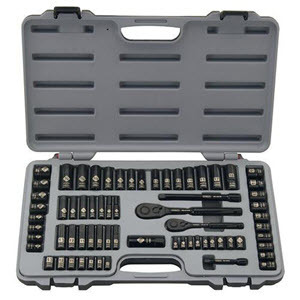 Mechanics Tool Set also features a full set of screwdriver bits and hex keys. 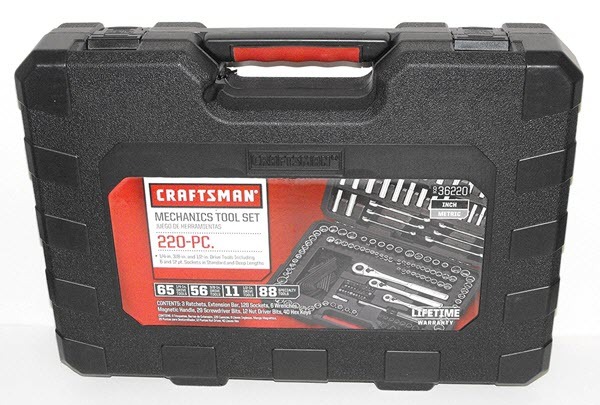 Along with a heavy-duty protective carry case, the Craftsman 220 pc. 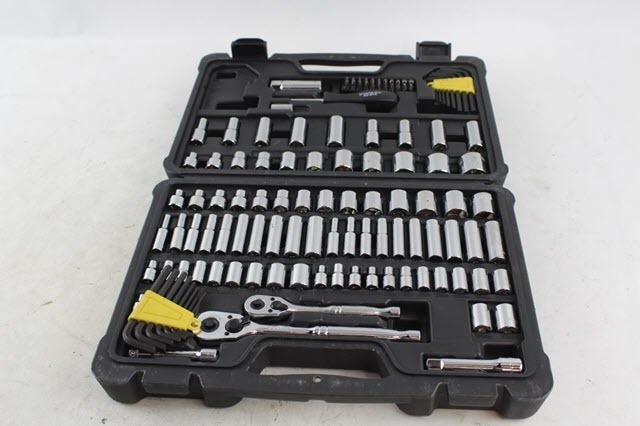 Mechanics Tool Set comes complete with a limited lifetime warranty from the manufacturer. So if you’re looking for the kind of complete kit you can buy once and never have to replace, you might not find a better deal for this kind of cash! 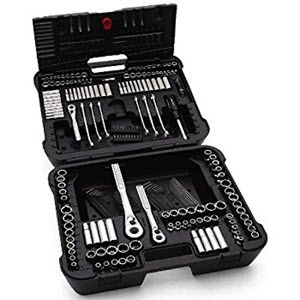 The kit contains 3 quick-release ratchets, 1 extension bar, 128 sockets, 6 wrenches, 40 hex keys, 1 magnetic holder, 29 screwdriver bit sets and 12 nut driver bits. Highly-recommended for private and professional use alike! ​Due to the sheer range of shapes, sizes, types and complete kits available, knowing where to start when buying a socket set can be difficult. Which is precisely why the vast majority of buyers simply pick up the first affordable kit they come across and hope for the best. But what’s important to remember when shopping for a socket set is that there’s far more to it than size and compatibility alone. Fail to take quality into account, and you could be looking at a wasted investment. ​Both metric and SAE sockets are available in three drive sizes: ¼-inch, 3/8-inch, and ½-inch. Each requires an alternate ratchet – one size most certainly does not fit all! Meaning that along with the size of the sockets themselves, you also need to think carefully about drive size – i.e., the size of the connecting attachment. The larger the drive size, the greater the torque provided and the more punishment the tool can handle. ​Depending on the application, shallow sockets may be entirely unsuitable. If the stud or screw makes contact with the end/bottom of the socket before it reaches the stud or screw for a snug fit, it isn’t going to work. That said, deep sockets aren’t always suitable for applications where there may be very limited headroom or general space to work with. As such, you need to think carefully about your intended application for the socket set and ensure you choose between deep and shallow sockets accordingly. ​Some of the better socket sets on the market include (or are at least compatible with) additional elements like extensions. Which as the name suggests simply extend the reach of the ratchet itself, making it far easier to get into tighter and tricky spaces. Again, whether or not you require a ratchet extension will be determined by how you intend to use the kit. ​The more pieces a socket set contains, the more adaptable and versatile it will be. But at the same time, an extensive kit containing more than 500 pieces isn’t going to be particularly portable. 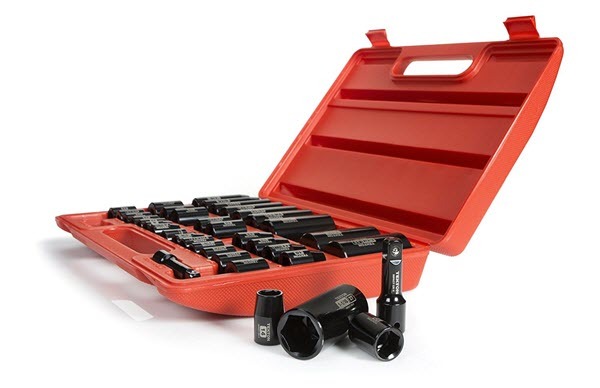 If you intend to use your socket set on the go, it’s worth looking at the more compact options on the market that feature the precise sockets/fittings you need and nothing more. ​Last but not least, never underestimate the importance of quality when selecting a socket set. The reason being that just because two socket sets look relatively similar doesn’t mean they have anything in common whatsoever when it comes to quality and performance. From the materials used to the manufacturing process to the preciseness of their design to the comfort/grip of the handle to accuracy of the socket measurements, quality can and will make a big difference. So rather than simply opting for the first set you come across, ensure it’s a set that ticks all the right boxes in terms of quality and performance.